Category Archives for "Document Types"
Would you want to ride in a 70-year old bus or in a 70-year old plane? So why should VIA be stuck with 70-year-old trains? Canada is the only G7 nation that has not seen significant capital funding in intercity passenger rail in a generation. Since 2000, Via has only received a total of $1.6 billion (2017 dollars) for capital investments. In comparison, the United Kingdom spends more than that on passenger rail capital projects each year... ( Click here for The Ottawa Citizen's story from May 2017 ) The last time VIA was able to buy new, purpose-built equipment was in the early 1980s. Transport Action Canada is fighting to bring home that point to the federal government. The current government talks big on the environment and climate change, as well as infrastructure investment and public transportation, however when it comes to intercity passenger rail, so far we've seen no action. The above photo is one of VIA's HEP-2 rail cars, which were originally built in 1947. Today, they are used on many of VIA's fastest and busiest trains in the Quebec City-Windsor Corridor. We find this completely unacceptable. Other than the United States, no other G7 country runs rolling stock even nearly as old. Even in the US, the oldest equipment on their busiest, fastest corridors is 30 years younger than VIA's HEP-2 cars!. Canadians expect and deserve better. Not only are these antique train cars old, they are less reliable, have ever increasing maintenance costs, and a drastically reduced ride quality when compared to more modern train cars. Most importantly, their remaining useful life-expectancy is rapidly running out. The LRC cars that make up the majority of VIA's Corridor fleet are younger, but passing 35 years old they're also on their last legs. Even VIA's newest equipment, the Renaissance cars purchased second-hand from the UK, is in trouble. These cars were not built to operate in Canadian conditions, and they have become unreliable and costly to maintain. Their life expectancy is also running out, which poses a major threat to the future of VIA's long distance services in Atlantic Canada. Transport Action Canada is embarking on a mission to send this message to Ottawa. We're chugging along, but we need help. Help us send this message to Ottawa. We'll make sure it arrives on-time for next year's budget considerations. 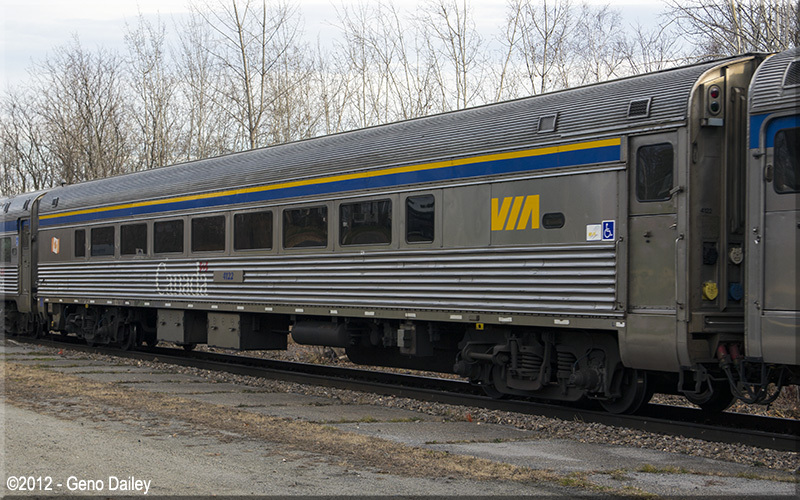 Click here to climb aboard our campaign for new VIA Rail rolling stock! Transport Action Prairie has a new Vice-President! Steffen Knippel is a professional consultant with experience representing international, national and indigenous clients in rail transportation, resource development, traditional knowledge, and claim settlement planning. He emphasizes both the social and economic dimensions of projects, including the transportation concerns of First Nation and other clients living in remote areas of northern Manitoba and Saskatchewan. He is also a member of the International Association for Impact Assessment and the National Farmers Union. Formerly a rail economist with the National Transportation Agency of Canada, Steffen gained further experience internationally during the 1990s as a rail costing consultant on commercialization projects in Myanmar, Uganda, Kenya, Tanzania, and Mozambique. Steffen considers his involvement in creating northern Manitoba's Keewatin Railway Company, one of the first indigenous-owned railways in Canada, a career highlight. REMINDER: TRANSPORT ACTION CANADA NEEDS YOU! In our last e-Newsletter, we sent out this plea for help. Many of you responded, but we still need you. If you have not yet donated, please consider doing so now. If you have, please share our plea with your family, friends, colleagues, even people you meet on the street. We NEED you. Last week, we sent out a distress message, asking members and supporters to help TAC avoid disaster. Transport Action Canada is the owner of a JMG-1 locomotive, from the Québec Central Railway. We accepted this donation on behalf of Le Groupe TRAQ and in order to donate it to a railway museum south of Québec City. Unfortunately, there have been difficulties making the transfer to the museum and the locomotive has been stored on a MTQ (Québec's Ministry of Transportation) lot while we waited for critical rail infrastructure needed to move the locomotive was repaired. Unfortunately, late this spring, the locomotive was the site of an act of criminal vandalism and theft. Thieves broke into the lot and attempted to steal copper and other metal pieces off of the locomotive. Due of this theft and vandalism, there was a waste spill from the locomotive that contaminated the soil surrounding it. Transport Action Canada was responsible for the spill and was helped by Le Groupe TRAQ in managing the cleanup. We are very thankful for their help, however we are now in a dire situation, owing over $30,000 for the cleanup costs. This is why we desperately need your help. Can you donate $20, $50, $100, or even more to help us pay this debt and keep us from closing up shop? Click here NOW to donate now to the JMG-1 Environmental Cleanup Fund! Submit a story for the next e-blast! OTTAWA – Transport Action Canada is stunned, even outraged, by the Transportation 2030 Vision presented in Montreal by Transport Minister Marc Garneau last Thursday. The Amtrak system, the US equivalent of VIA Rail, demonstrates that short, intermediate and long-distance trains can be heavily used, and gain significant ridership. Amtrak’s success is bringing demands across the US for increased train service of all kinds. Transport Action believes that this would happen in Canada if our passenger train network was modernized, expanded, reliable and lower-cost. Adding new discount airlines may be helpful to some, Budd says, but short-haul air travel is a poor solution for a government committed to “real change” and reducing greenhouse gases. If Canada followed the lead of countries like France, Germany, Japan, China and the US, by making investments in passenger rail, we would get much closer to our climate change targets, he predicted. Passengers would continue to fly for most long distance trips, but use or connect to fast efficient train networks for shorter journeys. Transport Action Canada works with its regional partners Transport Action Ontario, Transport Action Atlantic, and in Quebec and Western Canada to connect community groups, government stakeholders and businesses, and advocates for better travel options across the country. TAC has commissioned many studies, available on its website, showing how passenger rail networks can be improved quickly and affordably. Toronto Council will be voting in July to approve a new rapid transit network. A cautionary note was sent to key Councillors indicating that the decision should be deferred until Metrolinx-lead work on fare integration is complete. In July, Council will be asked to approve a conceptual transit network prepared by City Planning that is to be supported by a model forecasting projected ridership in 2031 and 2041, as provided by Dr. Eric Miller using the GTA Model version 4. This model includes assumptions about fares. As you probably know, there is a Metrolinx-led parallel exercise taking place on fare integration affecting most of the GTA (including Toronto) that is independent of the modeling work being prepared by Dr. Miller. At this time, Dr. Miller can only realistically use the status quo fare structures currently in place on GO Transit and the TTC, in the absence of an approved new policy on fare integration passed by either City Council or the province, as staff cannot make assumptions on such matters in the absence of such an approved policy. The schedules of the Miller report and the Metrolinx fare integration study are currently not in alignment, based on the updates received in April from Metrolinx and in March from City Planning. These two initiatives must have their schedules coordinated for Dr. Miller’s model to reflect the fare context of the GTA in 2031, instead of fare context the GTA has today. The fare integration policy will not be known until the Fall, as September may the first opportunity City Council has to vote on it based on Metrolinx’s current timetable with consultations concluding in August. The ridership model that Dr. Miller has been preparing for City Planning therefore will not reflect the network before Council because the fare assumptions will not be appropriate – this is unfair to Dr. Miller and is not helpful to Council. Fares have a significant influence on rider route choice and ridership demand. Without the completed fare integration work prepared by Metrolinx, Dr. Miller cannot prepare a reliable model for Council to base their decisions on since nobody at this stage has any confidence in what the future integrated fare structure may look like. Given the size and complexity of the decision coming before Council, and the delicate, even vulnerable, balance in which the existing subway network currently finds itself, with potentially worrisome impacts on public safety due to extreme platform crowding at the Bloor-Yonge station and possibly other stations at the southern end of the Yonge line, Council must have reliable modeling results to make such decisions. We urge Council to defer this decision until the fare integration work is ready and available to Dr. Miller and ridership results based on those inputs included in a report before Council. We will be happy to answer any questions on this important matter. Michael Enright of the CBC Sunday Morning radio show presented a poignant essay on the decades-long decline of passenger rail in Canada, the current challenges faced by VIA Rail and the need for significant federal investment.